Best lenses for Nikon D850 digital SLR camera are listed below. These are the recommended lenses for the latest Nikon D850. Here are the top rated Nikon D850 lenses. You’ve already got the Nikon D850, an amazing full-frame DSLR of Nikon cameras. Now it’s time to invest into building a lens system. With that in mind, we wanted to list the best lenses for Nikon D850 in various categories. All of these have superb image quality. Here are the top recommended lenses for Nikon D850 DSLR camera, including leading prime and zoom options from wide-angle to telephoto. You can choose the one you need. The most important factors before buying a lens is deciding the price for its focal length, aperture size and of course the image quality. Below are the top recommended and best Nikon D850 lenses that are excellent for professional photographers and serious hobbyists. Nikon 28-300mm f/3.5-5.6G ED VR ($947): Extremely versatile and a good value! It’s currently the only all-in-one lens for FX. Fast, accurate, and quiet auto focusing. The lens offers superior sharpness and color correction by effectively minimizing chromatic aberration, even at the widest aperture setting. If you are looking for cheap and good macro lenses, Nikon 105mm f/2.8G IF-ED VR Micro ($897) and Tamron SP 90mm f/2.8 Di VC USD Macro ($649) lenses are great choices for D850. Sigma 85mm f/1.4 DG HSM Art ($1,199): Highly Recommended! An ultimate portrait lens that offers attractive booked effect and precise focus is possible to achieve to focus on the pupils of subjects eyes while blurring the eyelashes. Ideal for professional photographers and discerning photography enthusiasts for portrait photography, low-light photography, night photography, landscape photography, photojournalism, events, and wedding photography. Nikon 85mm f/1.4G ($1,597): Excellent Nikon prime! This Nikon 85mm f/1.4G lens delivers incredibly sharp images and its fast f/1.4 aperture ensures a bright viewfinder image as well as beautiful background blur. Well suited for portraits, general purpose and low light work. So you are trying to choose a standard zoom lens for your Nikon D850. The new released AF-S NIKKOR 24-70mm f/2.8E ED VR lens would be the best standard zoom lens for Nikon D850. If you are looking for cheap 24-70mm lenses, Tamron SP 24-70mm G2 and Sigma 24-70mm Art lenses are both great lenses for Nikon D850. Sigma 20mm f/1.4 DG HSM Art ($899): With class leading performance, this lens is ideal for landscape photography, videography, astrophotography, lowlight or indoor photography and event photography. Nikon 20mm f/1.8G ED ($797) and Rokinon SP 14mm f/2.4 ($999) are also excellent super wide-angle prime lenses. Nikon 14-24mm f/2.8G ED ($1,897) is ofcourse highly recommended! Nikon 14-24mm f/2.8G ED is one of the best wide angle lenses available for landscape photography. The new released Sigma 12-24mm f/4 DG HSM Art lens is another great lens with high image quality. If you are looking for a cheap wide-angle zoom lens for D850, Nikon 16-35mm f/4G ED VR ($1,097), Tamron SP 15-30mm f/2.8 Di VC USD and Nikon AF-S NIKKOR 18-35mm f/3.5-4.5G ED lenses are great lenses. Nikon 8-15mm f/3.5-4.5E ED Fisheye ($1,247): Excellent Fisheye Lens! Widest NIKKOR fisheye lens yet and the first with zoom capability – and the first NIKKOR zoom to capture epic 180° circular images. The AF-S FISHEYE NIKKOR 8-15mm f/3.5-4.5E ED lens brings a new level of versatility and sharpness to extreme wide-angle lenses, freeing you to choose the right fisheye perspective for the shot; to create frame-filling images from as close as 0.5 feet from your subject or to follow your passion into challenging, heavily backlit, even wet and dirty situations. Equally suited for still photography and video work. For the Telephoto Prime lenses, there are several great choices for Nikon D850. The new released AF-S NIKKOR 300mm f/4E PF ED VR lens should be best choice. It comes packed with a lot of new features and brings best image quality for your Nikon D850. The new released Tamron SP 70-200mm f/2.8 Di VC USD G2 ($1,299) is the best selling 70-200mm lens for Nikon DSLRs. This lens is $1,500 cheaper than new Nikon 70-200mm f/2.8E FL ED VR ($2,797) yet offers similar image quality. If fast aperture is not important for you, than the Nikon AF-P 70-300mm f/4.5-5.6E ED VR ($747) is an excellent lens with affordable price. 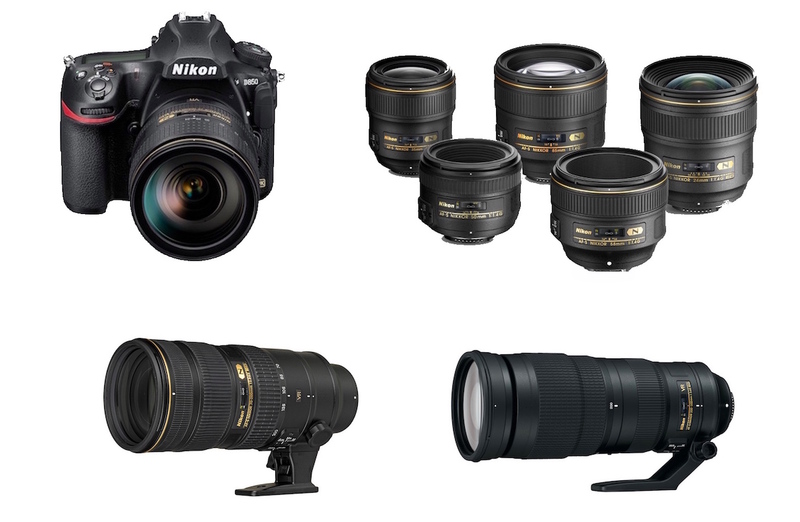 Below are the super telephoto zoom lenses for wildlife and sports photography. Sigma 150-600mm f/5-6.3 DG OS HSM Sports ($1,999) and Tamron SP 150-600mm f/5-6.3 Di VC USD G2 ($1,399) are both affordable Telephoto Zoom lenses for Nikon D850. Next post: What to Expect from Panasonic LX200 Camera?